Well it is Monday and just 4 days until Christmas!! I was trying out a new attitude of "what's done gets done" and no one would really notice the difference anyway. And then my little guy decided to stay up ALL last night. No fever, no other red flags, just not sleeping. So of course that means no sleep for me either. And thus, my upbeat attitude has taken a backseat to exhaustion. But it was a productive weekend with lots of baking and wrapping. 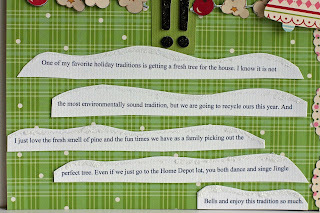 In other news, the ScrapTiffany challenge this week is to scrap your holiday traditions. I've realized recently that getting a fresh tree is a tradition that I've enjoyed since I was a kid and is onethat I am no where near ready to give up (no matter how many times Scott says, "have you seen how real artificial trees look these days?"). Here is my layout with a few photos from this year's trip to Home Depot to get our fresh tree. Even though it is the Home Depot lot and not a trip to the mountains, the kids are so excited and the smell of fresh pine reminds me so much of Christmas. 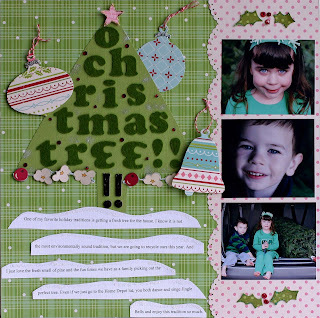 I've had the O Christmas Tree shaped title in my head for a while now and have been itching to use these October Afternoon papers since I laid eyes on them. 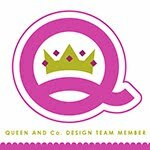 Go on over to ScrapTiffany and check out all the wonderful holiday traditions each of the designers shared. I have a few other Christmas photos to play with. 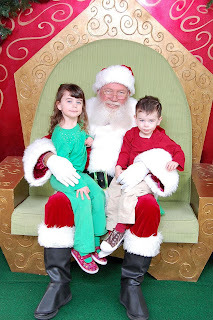 We went to see Santa for the first time this year. He was set up at the outdoor mall play area that we go to all the time so I figured the kids would be comfortable with the location. We got there minutes before noon when they opened and already there was a line. They both waited relatively patiently, although Little Man made me carry him he whole time and Little Miss was dancing around in excitement. Once we got to the front of the line they both got very shy. 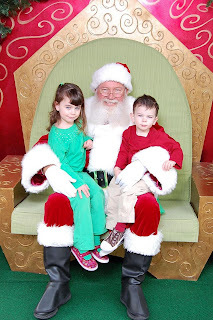 They got onto Santa's lap and no one cried, but there werent any big smiles either. Little Man barely looked up long enough for the photographer to snap 3 shots. When Santa asked Little Miss what she wanted for Christmas she said, "uuuummmmmmm" and tapped her finger on her chin. 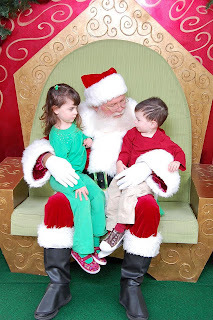 Cute cute photos of your kiddies with Santa!!! And I just adore the layout, I love how you did the title and the journaling on strips that look like snow. Great layout!! I love your Christmas tree layout! Very creative on placing the letters. Cute pics too!